Desk Dreams - 01 — Black Jellybean Co.
Those of you who know me will know that I love a good desk. A clean desk with too many monitors for one person to look at. Neon lights and figurines. I love it all. That's why I have created this new blog titled 'Desk Dreams'. Showcasing the desks that I dream about and wish I could have but just don't have the money or space to accommodate these beauties. Whats better than one Ultrawide Monitor? Two Ultrawide Monitors! Powered by a beast Mac Pro of course. Clean, tidy and productive! I don't even know what to say but wow. Can I have this inside my house like right now? 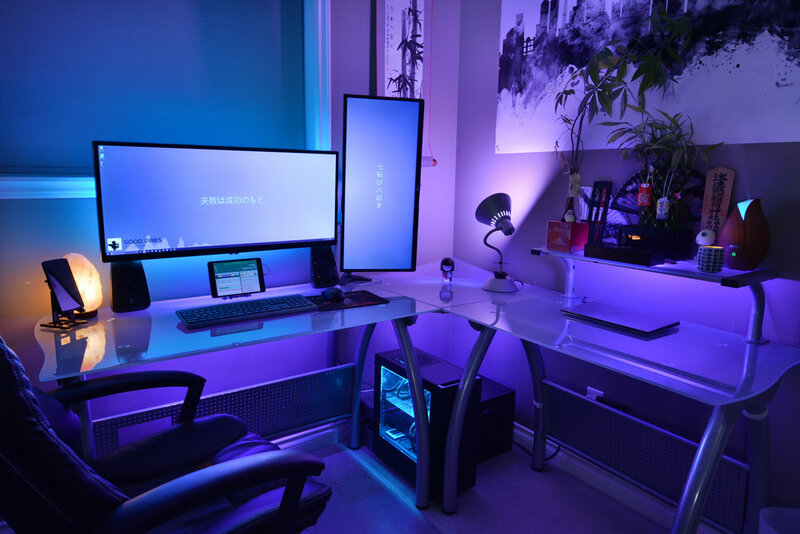 Neon lights will always make a setup 100000000x better. Trust. Okay. I think we need another photo to appreciate the true amount of CLEEEEEAN that this setup is displaying right now. The specs, my God the specs! I don't know what to say about this setup. Ill just leave you with a quote by the great tachyonpulseN7 in the comments of the original post.